Last year, my Independence Day blog post was about the history of the barbecue and how America has four types of barbecues: Carolina (North and South), Memphis (Tennessee), Kansas City (Missouri), and Texas. This year, I thought I might touch on hamburgers: their origins, how America popularized them, and whether or not the burger is still relevant in a world where people are watching their waistlines and opting for healthier alternatives. What can be said about the hamburger that hasn’t been said in other food blogs, food magazines, cookbooks, and fast food advertisement? It’s been touted as the perfect food: ground beef (or turkey, or chicken, or chickpeas and black beans, if you want to go vegetarian), seasoned to your liking, mixed with egg, formed into a patty, fried on a griddle or put on a grill (ideally, a propane one, if you’re like Hank Hill), but will settle for being pan-fried or put on a charcoal grill, and either served as is or topped anything from ketchup, cheese, mustard, pickles, relish, bacon, and/or onions (raw or fried) to grilled fruits (usually pineapple), fried eggs, or any kind of fruit-flavored chutney. But the hamburger is more than just a sandwich; it’s an American culinary icon, much like fried chicken (yes, fried chicken. The old stereotype of African Americans loving it confuses me as white people love fried chicken just as much) and apple pie. In fact, the hamburger is a lot like American history/society: filled with conflicting stories on its origins, can be very cheesy and disgusting to non-American sensibilities (yet most people do want a taste of it just to see if it’s everything they dreamed it would be), known and praised/disparaged all over the world, and associated with wanting everything done fast rather than done right. In the 12th century, the nomadic Mongols, led by Genghis Khan (1167–1227), carried food made up of several varieties of milk and meat (horse or camel) shaped into patties during their journeys. This was to not only extend their supply of meat, but also as a quick way to eat as they were laying waste to and conquering what is now Central Asia (Russia, Ukraine, and Kazakhstan, specifically). In the height of the Mongol Empire, it was common to see Mongol warriors following herds or flocks of horses, sheep, or oxen and killing them for food. The explorer Marco Polo recorded these sightings, even pointing out that a single pony could feed 100 Mongol invaders. This recipe for the minced meat patty was passed on the Muscovites when Genghis’ grandson, Kublai Khan, invaded Russia after the Mongol Empire fell in the 1240s. In Moscow, the patty was known as steak tartare (yet the recipe for it was never recorded and, to this day, no one knows when the recipe was first recorded for restaurant use). In the city-states that would later be known as Germany, this ground meat product was refined by adding capers, onions and even caviar to the blend and was sold on the streets. Well, yes and no. It wasn’t called the “hamburger” right away. It was called the Hamburgh (that’s how the city name was spelled at the time) Sausage. Besides, the sandwich (and the use of bread slices between a meat filling) wouldn’t be known until the 18th century, thanks to English aristocrat John Montagu (better known as The Earl of Sandwich), who came up with a new way to eat so his fingers wouldn’t get dirty while playing card games. There was an episode of the early 2000s Cartoon Network show, Time Squad, that parodied how The Earl of Sandwich came up with this culinary sensation. I uploaded the episode and the storyboards for it for anyone who wants to see it. Fast forward to the 19th century, which sees Hamburg, Germany as the largest trans-Atlantic hub for freight and shipping. The Hamburg steak, an early ancestor of the hamburger and known at that time as either “Hamburg-style American fillet” or “beefsteak à Hambourgeoise,” is being served to attract German sailors. It was brought back to New York City and became popular on the menus of many restaurants in this U.S. port. This kind of fillet was beef minced by hand, lightly salted and often smoked, and usually served raw in a dish along with onions and bread crumbs. Now this isn’t the hamburger as we know it yet. It’s actually Salisbury steak, named after American physician and food faddist, Dr. James Salisbury (1823-1905), served with brown gravy, and is a common sight in many an unappetizing frozen TV dinner or mediocre school cafeteria menu. However, it does go great with buttered noodles and your choice of green bean casserole or vegetable medley. 3) all claims made by the potential inventors of the hamburger occurred between 1885 and 1904, focusing all attention of its creation onto these two decades. Contemporary American society at the dawn of the 20th century witnessed the creation of new fast food originating from traditional foods from various ethnic groups, such as China’s chop suey (and other take-out favorites that originally were supposed to be for other Chinese immigrants who moved to America, but became popular among those who weren’t Chinese, but were American), pizza from Italy (though that would not gain popularity until after World War II), and hot dogs (invented by German immigrant Charles Feltman, who sold frankfurters on sliced bread at Coney Island). The dawn of the 20th century also witnessed the need to provide food for people living in highly productive urban centers with high population densities. Food also had to be economically affordable for the working class so they can maintain their labor and industrial production. The hamburger and its derivatives were born in a time when people didn’t have the time or energy to make anything to eat and would rather eat “fast” and “cheap,” a decision that has stuck with the American way of life to this day. Though there have been plenty of arguments and claims to the contrary, Louis’ Lunch in New Haven, Connecticut has been credited by The Library of Congress as the very first burger joint. Lassen may have made the hamburger popular in 1895, but it wouldn’t be until 1916 when the hamburger patty (actually, a Salisbury steak patty, thanks to anti-German sentiment during and after World War I) would be served on a bun. For that, you can thank Walter Anderson, who, five years after he invented the burger bun, co-founded one of the earliest hamburger restaurants in America: White Castle. You can also thank White Castle for selling their hamburgers in grocery stores and vending machines, creating the industrial-strength spatula, mass-producing the humiliating paper hat associated with the embarrassing task of working fast-food service, and for birthing the concept of a “greasy spoon restaurant,” in which hygiene suffered in exchange for more inexpensive food (though that’s more the fault of wanting things done fast instead of right). Like anything remotely successful, White Castle bred a lot of imitators and attempts at capturing the restaurant’s success, with little to no success. One of the most obvious was White Tower Hamburgers of Milwaukee, Wisconsin, whose owners got into many a legal battle with White Castle over copyright infringement. 1937 saw Patrick McDonald and his two sons Richard and Maurice inaugurating a restaurant called “Airdrome” on Route 66 near the airport in Monrovia, California. Three years later in San Bernardino, Papa McDonald and his sons would go on to create the insanely popular restaurant people in America and the world over: McDonalds. The menu initially featured 25 different dishes, the majority of which were barbecued, but 80% of the restaurant’s revenue was made from selling hamburgers. It wouldn’t be until after World War II (due to beef shortages, though that didn’t slow down White Castle) that McDonalds’ popularity would soar, introducing the concept of fast food to the West Coast, working to improve on all of the things White Castle and other restaurants were doing to ensure the fastest service possible, and inventing the concept of “drive thru” ordering. By the 1950s, the concept of drive-in style service had become firmly established and hamburgers and cars had become closely connected in the minds of many Americans, particularly among the teenagers at that time, if pop culture and pointless nostalgia of the era has taught me anything. 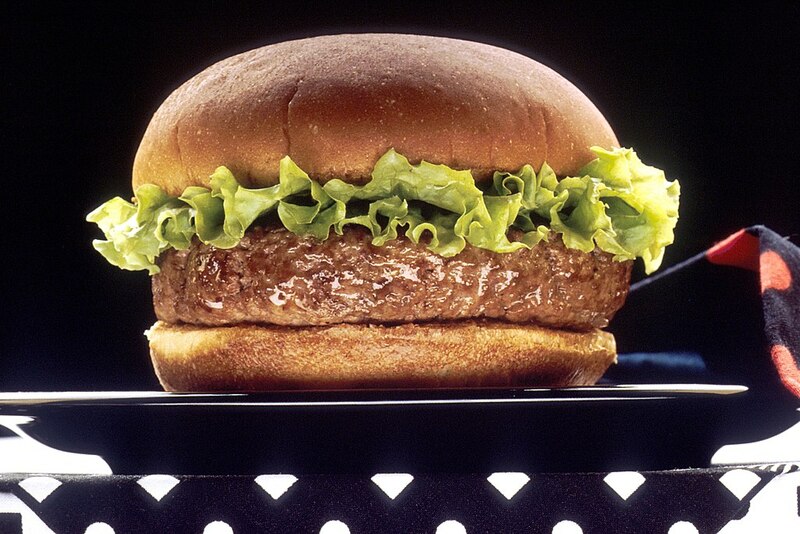 As private outdoor social events, often held in backyards and featuring a barbecue, became more widespread during the mid-1950s, the hamburger gained a new culinary and social relevance in America. It became that national symbol that separated the United States from those godless Reds who waited with baited breath to invade the country. It seems silly, but for anyone who still has relatives who lived during that era, it was a reality. You know the hamburger was a popular American symbol during the Cold War when one of the battles in the Vietnam War is named The Battle of Hamburger Hill, because of how the Viet Cong and American soldiers alike were reduced to bloody meat. War is hell, kids. There was also another war being waged during The Cold War (mostly during the 1960s and 1970s), and that was “The Burger War,” in which McDonalds fought with Burger King and Wendy’s over who had the better hamburger. No lives were lost nor soldiers injured (unless you count the many who have had heart attacks, stroke, and diabetes from all that burger-noshing), but it did cause the prices of their burgers increased, and the days when a hamburger could be bought for just a few cents (a nickel at most) were a thing of the past. Now, we’re in the era of everyone watching their waistlines and cutting down on the junk so they can live longer to complain about how life isn’t what it used to be. The hamburger, while still being celebrated with haute cuisine makeovers and being positively to neutrally portrayed on such TV shows and movies as Good Burger, SpongeBob SquarePants (with the titular character working at The Krabby Patty), American Eats, Man vs. Food, Bob’s Burgers, and Harold and Kumar Go to White Castle, has also come under fire for lack of nutritional value and being one of a myriad of causes in the obesity epidemic. There are also environmentalists and animal rights activists protesting on how the big-chain restaurants are killing people with mediocre meat and slashing rainforests for more cattle-raising room.